ScanBizCards Business Card Reader now available on the AppExchange, the world's most-popular marketplace for business apps. ScanBiz Mobile Solutions is tapping into the social, mobile and open capabilities of cloud computing to transform customers into social enterprises. ScanBizCards Business Card Reader now available on the AppExchange, the world's most-popular marketplace for business apps. ScanBiz Mobile Solutions is tapping into the social, mobile and open capabilities of cloud computing to transform customers into social enterprises. ScanBiz Mobile Solutions today announced it has launched its new mobile app on salesforce.com's AppExchange Mobile, extending the marketplace built for the social enterprise. ScanBizCards Business Card Reader is among the first apps to leverage AppExchange Mobile, tapping into the power of the proven Force.com platform, salesforce.com’s social enterprise platform for employee social apps. ScanBizCards Business Card Reader is currently available for test drive on the AppExchange Mobile. ScanBizCards Business Card Reader is an iPhone and Android mobile app that allows users to snap pictures of business cards, scan them, and then add them to their contacts without having to tediously type in all the information. But scanning is just the beginning. ScanBizCards offers an enterprise suite of features including: export cards to Salesforce CRM, Data.com, or Excel, organize in folders, send quick intro e-mails to new contacts, schedule a follow-up appointment with automatic integration to the phone's calendar, and more. Users can also subscribe to the web sync service which backs up card data, keeps multiple devices in sync, and offers a full desktop application via a web interface. Most recently, ScanBizCards added the ability to have cards manually transcribed, ensuring 100 percent accurate results. “We're excited to be part of salesforce.com’s Mobile AppExchange. ScanBizCards turns business cards into active leads in the powerful Salesforce sales pipeline where the organization can begin processing them while the salesperson is still talking to that prospect!” said Patrick Questembert, co-founder, ScanBiz Mobile Solutions. The number of social networking users has surpassed e-mail users. And people access the Internet more from mobile devices than from desktops. Salesforce.com is helping companies meet the challenge of this social revolution with the social enterprise. Today, companies must change the way they collaborate, communicate and share information with customers and employees to stay competitive. By leveraging salesforce.com’s social, mobile and open cloud technologies, companies can transform themselves into social enterprises by developing social profiles of customers, creating employee social networks and building customer and product social networks. Cloudforce New York attendees will be able to learn firsthand how to join this transformation. 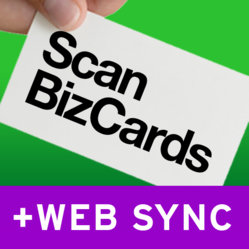 ScanBizCards was first released on the iTunes App Store in October of 2009, and has seen frequent updates adding functionality and improving accuracy, continuing to the present. The Android version was first released in early 2011 and a Windows Phone version is under development. ScanBiz Mobile Solutions is a mobile development company, based in New York, targeting the needs of mobile business professionals on iOS and Android phones with additional platforms in the works. Its flagship product ScanBizCards Business Card Reader has been one of the top business apps for two years running. Force.com is the trusted social enterprise platform for building and running any employee app in the cloud. Force.com powers the Salesforce CRM apps, the more than 250,000 custom apps used by salesforce.com customers such as Japan Post, Kaiser Permanente, KONE, and Sprint Nextel and the more than 1,300 ISV apps built by partners such as BMC, FinancialForce.com and Fujitsu. Enterprise apps built on the Force.com platform can be easily distributed and marketed through the salesforce.com AppExchange http://www.salesforce.com/appexchange/. The salesforce.com social enterprise platform delivers the most trusted and comprehensive cloud technologies for social, mobile and open apps. It includes Force.com, the cloud platform for employee apps, Heroku, the cloud platform for customer apps and Database.com, the cloud database to integrate the social enterprise. Salesforce, Dreamforce, Force.com, Heroku, AppExchange, Database.com and others are trademarks of salesforce.com, inc.